From The Loyalty Pledge To Mueller As A 'Savior': 2017's Most Popular Russia Stories The investigation into Russian interference in the 2016 presidential election began more than a year ago, and the story has only gotten more complicated. Here are the highlights from NPR.org. 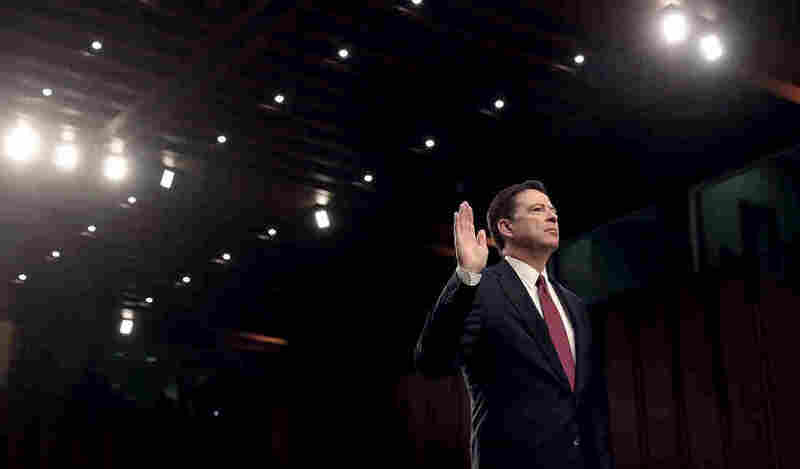 Former FBI Director James Comey is sworn-in before testifying before the Senate Intelligence Committee on Capitol Hill on June 8. A number of congressional committees are looking at different aspects of the Russia imbroglio, and the Justice Department appointed a special counsel, Robert Mueller, to do the same. Deputy Attorney General Rod Rosenstein made that move after Trump fired the FBI director originally tasked with overseeing the investigation into his campaign's connections to Russia. A lot of this story played out in public, in open hearings and now infamous interviews, and it's not over yet. Here are the most popular Russia-related stories on NPR.org this year.